Yrjö Engeström is the founder and leader of the Center for Activity Theory and Developmental Work Research at the University of Helsinki in Finland and is at the same time Professor at the University of California, San Diego. He fundamentally builds his theoretical work on the so-called cultural-historical or activity-theoretical approach to learning and mental development, which was first launched in the Soviet Union in the 1920s and 30s by Lev Vygotsky. However, in his dissertation on “expansive learning” in 1987, he combined this approach with the system theoretical work of Briton Gregory Bateson on double-bind situations and learning levels and thereby introduced the notion of conflicts which were absent in Vygotsky’s framework. In the following slightly abridged version of an article, Engeström sums up the historical development and current status of activity theory and illustrates its potential with a case story from the work at his Boundary Crossing Laboratory in Helsinki. Who are the subjects of learning – how are they defined and located? Why do they learn – what makes them make the effort? What do they learn – what are the contents and outcomes of learning? How do they learn – what are the key actions of processes of learning? In this chapter, I will use these four questions to examine the theory of expansive learning (Engeström, 1987) developed within the framework of cultural-historical activity theory.Before going into expansive learning, I will briefly introduce the evolution and five central ideas of activity theory. The four questions and the five principles form a matrix which I will use to systematize my discussion of expansive learning. I will concretize the theoretical ideas of this chapter with the help of examples and findings from an ongoing intervention study we are conducting in the multi-organizational field of medical care for children in the Helsinki area in Finland. After presenting the setting and the learning challenge it was facing, I will discuss each of the four questions in turn, using selected materials from the project to highlight the answers offered by the theory of expansive learning. | page_54 | I will conclude by discussing the implications of the theory of expansive learning for our understanding of directionality in learning and development. Figure 4.1 (A) Vygotsky’s model of mediated act and (B) its common reformulation. Figure 4.2 The structure of a human activity system (Engeström, 1987, p. 78). activity system. The object is depicted with the help of an oval indicating that object-oriented actions are always, explicitly or implicitly, characterized by ambiguity, surprise, interpretation, sense-making, and potential for change.The concept of activity took the paradigm a huge step forward in that it turned the focus on complex interrelations between the individual subject and his or her community. In the Soviet Union, the societal activity systems studied concretely by activity theorists were largely limited to play and learning among children, and contradictions of activity remained an extremely touchy issue. Since the 1970s, the tradition was taken up and recontextualized by radical researchers in the West. New domains of activity, including work, were opened up for concrete research. A tremendous diversity of applications of activity theory began to emerge, as manifested in recent collections (e.g. Chaiklin et al., 1999; Engelsted et al., 1993; Engeström et al., 1999). The idea of internal contradictions as the driving force of change and development in activity systems, so powerfully conceptualized by Il’enkov (1977), began to gain its due status as a guiding principle of empirical research. Ever since Vygotsky’s foundational work, the cultural-historical approach was very much a discourse of vertical development toward “higher psychological functions.” Luria’s (1976) cross-cultural research remained an isolated attempt. Michael Cole (1988) was one of the first to clearly point out the deep-seated insensitivity of the second-generation activity theory toward cultural diversity. When activity theory went international, questions of diversity and dialogue between different traditions or perspectives became increasingly serious challenges. It is these challenges that the third generation of activity theory must deal with.The third generation of activity theory needs to develop conceptual tools to understand dialogue, multiple perspectives, and networks of interacting activity systems. Wertsch (1991) introduced Bakhtin’s (1981) ideas on dialogicality as a way to expand the Vygotskian framework. Ritva Engeström (1995) went a step further by pulling together Bakhtin’s ideas and Leont’ev’s concept of | page_56 | activity, and others have developed notions of activity networks, discussed Latour’s actor-network theory, and elaborated the concept of boundary crossing within activity theory.These developments indicate that the door is open for the formation of the third generation of activity theory. In this mode of research, the basic model is expanded to include minimally two interacting activity systems (Figure 4.3). In Figure 4.3, the object moves from an initial state of unreflected, situationally given “raw material” (object 1; e.g. a specific patient entering a physician’s office) to a collectively meaningful object constructed by the activity system (object 2; e.g. the patient constructed as a specimen of a biomedical disease category and thus as an instantiation of the general object of illness/health), and to a potentially shared or jointly constructed object (object 3; e.g. a collaboratively constructed understanding of the patient’s life situation and care plan). The object of activity is a moving target, not reducible to conscious short-term goals.In its current shape, activity theory may be summarized with the help of five principles (for earlier summaries, see Engeström, 1993, 1995, 1999a). The first principle is that a collective, artifact-mediated and object-oriented activity system, seen in its network relations to other activity systems, is taken as the prime unit of analysis. Goal-directed individual and group actions, as well as automatic operations, are relatively independent but subordinate units of analysis, eventually understandable only when interpreted against the background of entire activity systems. Activity systems realize and reproduce themselves by generating actions and operations. Figure 4.3 Two interacting activity systems as minimal model for the third generation of activity theory. the participants, the participants carry their own diverse histories, and the activity system itself carries multiple layers and strands of history engraved in its artifacts, rules, and conventions. The multi-voicedness is multiplied in networks of interacting activity systems. It is a source of trouble and a source of innovation, demanding actions of translation and negotiation. The third principle is historicity. Activity systems take shape and get transformed over lengthy periods of time. Their problems and potentials can only be understood against their own history. History itself needs to be studied as local history of the activity and its objects, and as history of the theoretical ideas and tools that have shaped the activity. Thus, medical work needs to be analyzed against the history of its local organization and against the more global history of the medical concepts, procedures, and tools employed and accumulated in the local activity. The fourth principle is the central role of contradictions as sources of change and development. Contradictions are not the same as problems or conflicts. Contradictions are historically accumulating structural tensions within and between activity systems. The primary contradiction of activities in capitalism is between the use value and exchange value of commodities. This primary contradiction pervades all elements of our activity systems. Activities are open systems. When an activity system adopts a new element from the outside (for example, a new technology or a new object), it often leads to an aggravated secondary contradiction where some old element (for example, the rules or the division of labor) collides with the new one. Such contradictions generate disturbances and conflicts, but also innovative attempts to change the activity. Standard theories of learning are focused on processes where a subject (traditionally an individual, more recently possibly also an organization) acquires some identifiable knowledge or skills in such a way that a corresponding, relatively lasting change in the behavior of the subject may be observed. It is a self-evident presupposition that the knowledge or skill to be acquired is itself stable and reasonably well defined. There is a competent “teacher” who knows what is to be learned.The problem is that much of the most intriguing kinds of learning in work organizations violates this presupposition. People and organizations are all the time learning something that is not stable, not even defined or understood ahead of time. In important transformations of our personal lives and organizational practices, we must learn new forms of activity which are not yet there. They are literally learned as they are being created. There is no competent teacher. Standard learning theories have little to offer if one wants to understand these processes. In Finland, public health care services are principally funded by taxation, and the patient typically pays a nominal fee for a visit. A critical structural issue in the Helsinki area is the excessive use of high-end hospital services, historically caused by a concentration of hospitals in this area. In children’s medical care, the high-end of medicine is represented by the Children’s Hospital, which has a reputation of monopolizing its patients and not actively encouraging them to use primary care health center services. Due to rising costs, there is now much political pressure to change this division of labor in favor of increased use of primary care services. The problem is most acute among children with long-term illnesses, especially those with multiple or unclear diagnoses. Children with asthma and severe allergies are a typical and rapidly growing group. Such children often drift between caregiver organizations without anyone having overview and overall responsibility of the child’s care trajectory. This puts a heavy burden on the families and on the society.The Children’s Hospital decided to respond to the pressures by initiating and hosting a collaborative redesign effort, facilitated by our research group using a method called Boundary Crossing Laboratory. Approximately 60 invited representatives of physicians, nurses, other staff, and management from primary care health centers and hospitals responsible for children’s health care in the Helsinki area met in ten three-hour sessions, the last one of which was held in mid-February 1998. The participants viewed and discussed a series of patient cases videotaped by the researchers. The cases demonstrated in various ways troubles caused by lack of coordination and communication between the different care providers in the area. The troubles took the form of excessive numbers of visits, unclear loci of responsibility, and failure to inform other involved care providers (including the patient’s family) of the practitioner’s diagnoses, actions, and plans. The learning challenge in this setting was to acquire a new way of working in which parents and practitioners from different caregiver organizations will collaboratively plan and monitor the child’s trajectory of care, taking joint responsibility for its overall progress. There was no readily available model that would fix the problems; no wise teacher had the correct answer. Who and where are the subjects of learning? This learning challenge could not be met by training individual practitioners and parents to adopt some new skills and knowledge. The issue at stake was organizational, not resolvable by a sum total of separate individuals. On the other hand, there was no mythical collective subject that we could approach and push to take charge of the transformation. Top-down commands and guidelines are of little value when the management does not know what | page_60 | the content of such directives should be. The management of the Children’s Hospital – as competent and experienced as it was – was conscious of its own limitations in the situation and asked us to help.Recent theories of situated learning (Lave and Wenger, 1991; Wenger, 1998) and distributed cognition (Hutchins, 1995) tell us to look for well-bounded communities of practice or functional systems, such as task-oriented teams or work units, to become collaborative subjects of learning. But in the multi-organizational field of children’s medical care in Helsinki, there is no well-bounded work unit that could conceivably be the center of coordination. In each individual patient case, the combination of institutions, specialties, and practitioners involved in the delivery of care is different, and it is seldom possible to name a stable locus of control. Latour’s (1987) actor-network theory recommends that we locate learning in a heterogeneous network of human and non-human actors. This is fine, but Latour’s principle of generalized symmetry turns all the actors (or actants, as he prefers to call them) into black boxes without identifiable internal systemic properties and contradictions. If we want to successfully confront the various actors involved in the care, we must be able to touch and trigger some internal tensions and dynamics in their respective institutional contexts, dynamics that can energize a serious learning effort on their part.In our case, learning needs to occur in a changing mosaic of interconnected activity systems which are energized by their own inner contradictions. A minimal constellation of activity systems includes the activity system of the Children’s Hospital, the activity system of the primary care health center, and the activity system of the child’s family. In each particular patient case, the specific instantiation of the three activity systems is different. Yet, the general structural characteristics and network positions of each one of them remain sufficiently stable to allow analysis and redesign. In the Boundary Crossing Laboratory, the basic constellation of the three activity systems was implemented so that hospital practitioners sat on one side of the room and primary care health center practitioners sat on another side of the room. The voices of patients’ families came from the front of the room, from videotapes made by following patients through their hospital and health center visits and also from actual parents we invited to join in the sessions. INTERVIEWER I’m thinking to myself, would there be any room for negotiation, I mean, is it always so that one-sidedly one party, the hospital, decides that OK, now this is at such a stage that we can send him to primary care … Is there any discussion on this? PERSONAL PHYSICIAN Nobody has ever asked me, “Would you take this patient for follow-up?” But then again, I am not specialized in pediatrics. HEAD PHYSICIAN OF THE CHILDREN’S HOSPITAL And here I think we now have a pretty obvious issue, we just have to ask whether the patient record is actually sent to the primary care. While expansive learning was firmly distributed within and between the three key activity systems, actions like the one taken by the head physician demonstrate that individual agency is also involved. However, different individuals speaking in different voices take the leading subject position in the activity at different moments. The leading subject role and agency is not fixed, it keeps shifting. For situated learning theory (Lave and Wenger, 1991), motivation to learn stems from participation in culturally valued collaborative practices in which something useful is produced. This seems a satisfactory starting point when we look at novices gradually gaining competence in relatively stable practices. However, motivation for risky expansive learning processes associated with major transformations in activity systems are not well explained by mere participation and gradual acquisition of mastery. As I pointed out earlier, Bateson (1972) suggested that expansive Learning III is triggered by double binds generated by contradictory demands imposed on the participants by the context. In the Boundary Crossing Laboratory, we | page_62 | made the participants face and articulate the contradictory demands inherent in their work activity by presenting a series of troublesome patient cases captured on videotape. In several of these cases, the patient’s mother was also present. This made it virtually impossible for the participants to blame the clients for the problems and added greatly to the urgency of the double bind. HEAD PHYSICIAN OF THE CHILDREN’S HOSPITAL Why critical pathways, that has surely been explained sufficiently, and now I’ll only tell you that in the spring we started this activity. That is, the planning of critical pathways | page_63 | for children and adolescents in Uusimaa county. And we have a basic working group which has representatives from both the health center level and the central hospital level and from here and from all parties, that is, representatives of both nursing and physicians. With these reforms spreading and taking root, shouldn’t the problems with coordination and collaboration be under control? Evidence presented and discussed in Boundary Crossing Laboratory sessions led to the conclusion that this is not the case. Care relationships and critical paths were solutions created in response to particular historical sets of contradictions. These contradictions are rapidly being superseded by a new, more encompassing configuration of contradictions. Care relationships and critical paths respond to contradictions internal to the respective institutions. Care relationships are seen as a way to conceptualize, document, and plan long-term interactions with a patient inside primary health care. Their virtue is that the patient can be seen as having multiple interacting problems and diagnoses that evolve over time; their limitation is that responsibility for the patient is practically suspended when the patient enters a hospital. Correspondingly, critical paths are constructed to give a normative sequence of procedures for dealing with a given disease or diagnosis. They do not help in dealing with patients with unclear and multiple diagnoses, and they tend to impose their disease-centered worldview even on primary care practitioners. Fundamentally, both care relationships and critical paths are linear and temporal constructions of the object. They have great difficulties in representing and guiding horizontal and socio-spatial relations and interactions between care providers located in different institutions, including the patient and his/her family as the most important actors in care. Asthmatic and allergic children with repeated respiratory problems are a clear case in point. Such a child may have more than a dozen hospital visits, including some stays of a few days in a ward, and even more numerous visits to a primary care health center in one year. Some of these visits are serious emergencies, some of them are milder but urgent infections, some are for tests, control and follow-ups.One of the cases we presented in the Boundary Crossing Laboratory was Simon, age 3. In 1997, he had three visits to the district hospital of his municipality, 11 visits to the Helsinki University Central Hospital (HUCH) ear clinic, 14 visits to his personal physician at the local health center, and one visit to the outpatient clinic of the HUCH Children’s Hospital. Another case we presented, Andrew, age 4, had in 1997 four visits to the HUCH hospital for skin and allergic diseases, nine visits to his local district hospital, and 14 visits to his primary care health center. HEAD PHYSICIAN (IN AGGRAVATED TONE) But isn’t it quite common that children with allergies have these other problems? So surely they, surely you will plan some sort of a process which guarantees that these children do not belong to many critical pathways but …? Figure 4.4 Contradictions in children’s health care in the Helsinki area. | page_65 | and high cost of services provided by the central university hospital of which the Children’s Hospital is a part. Thus, there is an aggravated tension between the primary care health center and the university hospital. Health centers in the Helsinki area are blaming the university hospital for high costs, while the university hospital criticizes health centers for excessive referrals and for not being able to take care of patients who do not necessarily need hospital care. A contradiction also emerges between the new object (patients moving between primary care and hospital care) and the recently established tools, namely care relationships in primary care and critical paths in hospital work. Being linear–temporal and mainly focused on care inside the institution, these tools are inadequate for dealing with patients who have multiple simultaneous problems and parallel contacts to different institutions of care. In the activity system of the patient’s family, the contradiction is also between the complex object of multiple illnesses and the largely unavailable or unknown tools for mastering the object. HOSPITAL PHYSICIAN I kind of woke up when I was writing the minutes [of the preceding session]. … What dawned on me concerning B [name of the patient in the case discussed] is, I mean, a central thing … for the mastery of the entire care. How will it be realized and what systems does it require? I think it was pretty good, when I went back through our discussion, I think one finds clear attempts at solving this. It is sort of a foundation, which we must erect for every patient. RESEARCHER That seems to be a proposal for formulating the problem. What is … or how do we want to solve it in B’s case? I mean, is it your idea that what we want to solve is the mastery of the entire care? HOSPITAL PHYSICIAN I think it’s just that. I mean that we should have … or specifically concerning these responsibilities and sharing of responsibility and of practical plans, and tying knots, well, we should have some kind of arrangement in place. Something that makes everyone aware of his or her place around this sick child and the family. HOSPITAL HEAD PHYSICIAN We have these task force groups for the critical pathways in place, and they have also discussed this matter, and without exception they have the opinion that definitely not for every visit – I, too, would be afraid that if there is feedback for every visit, there will be so many pieces of paper that the essential information gets easily lost, so surely it would be better that the sender, that is those who are in charge of the care of the patient, should themselves assess when feedback needs to be sent. DATA SECURITY SPECIALIST Well, if I may comment on this. This would in my opinion be exactly building the critical pathway model, finding ways to improve the critical pathway and the work within it. HOSPITAL PHYSICIAN 1 An agreement is made only if the hospital care exceeds two visits or goes beyond a standard protocol, so in fact we imagine that the majority of visits will fall into those not exceeding two visits or the protocol. HOSPITAL PHYSICIAN 2 What may be new in this is that in the second visit, or the visit when the outpatient clinic physician makes the care agreement proposal, which is a kind of a vision for continuation of care, so he or she kind of presents this vision also to the parents sitting there, who become committed this way to this continuation of care and to the distribution of care responsibility, however the distribution is defined, something that probably has not been talked about so clearly to the parents. That’s what makes this excellent. INFORMATION SYSTEMS SPECIALIST In my opinion, this is a great system, and as an outsider, I say, implement this as soon as possible so that after a sufficient trial period we can duplicate this system elsewhere. This is a great system. Under the umbrella of care agreement, four interconnected solutions were created. First, the patient’s personal physician – a general practitioner in the local health center – is designated as the coordinator in charge of the patient’s network and trajectory of care across institutional boundaries. Secondly, whenever a child becomes a patient of the Children’s Hospital for more than a single visit, the hospital physician and nurse in charge of the child draft a care agreement which includes a plan for the patient’s care and the division of labor between the different care providers contributing to the care of the child. The | page_68 | draft agreement is given to the child’s family and sent to the child’s personal health center physician (and when appropriate, to the physicians in charge of the child in other hospitals) for their scrutiny. Thirdly, if one or more of the parties find it necessary, they will have a care negotiation (by e-mail, by telephone, or face to face) to formulate a mutually acceptable care agreement. Fourthly, care feedback, in the form of a copy of the patient’s medical record, is automatically and without delay given or sent to the other parties of the care agreement after the patient’s unplanned visit or changes in diagnoses or care plans. Figure 4.5 depicts a simplified model of the care agreement, produced and used by the practitioners in the Boundary Crossing Laboratory. The care agreement practice aims at resolving the contradictions depicted in Figure 4.4 by creating a new instrumentality. 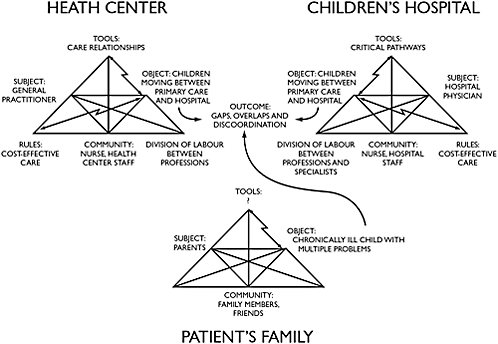 This instrumentality, when shared by parents and practitioners across institutional boundaries, is supposed to expand the object of their work by opening up the dimension of horizontal, socio-spatial interactions in the patient’s evolving network of care, making the parties conceptually aware of and practically responsible for the coordination of multiple parallel medical needs and services in the patient’s life. This does not replace but complements and extends the linear and temporal dimension of care. The solution also aims at relieving the pressure coming from the rule of cost-efficiency and the tension between the Children’s Hospital and health centers by eliminating uncoordinated excessive visits and tests and by getting the health center general practitioners involved in making joint care decisions that are acceptable to all parties.The new instrumentality is supposed to become a germ cell for a new kind of collaborative care, “knotworking,” in which no single party has a permanent dominating position and in which no party can evade taking responsibility over the entire care trajectory. The model implies a radical expansion of the object of activity for all parties: from singular illness episodes or care visits to a long-term trajectory (temporal expansion), and from relationships between the patient and a singular practitioner to the joint monitoring of the entire network of care involved with the patient (socio-spatial expansion). Figure 4.5 Conceptual model of the care agreement practice. How do they learn – what are the key actions? Theories of organizational learning are typically weak in spelling out the specific processes or actions that make the learning process. One of the more interesting attempts to open up this issue is Nonaka and Takeuchi’s (1995) framework of cyclic knowledge creation, based on conversions between tacit and explicit knowledge. Their model posits four basic moves in knowledge creation: socialization, externalization, combination, and internalization. A central problem with Nonaka and Takeuchi’s model, and with many other models of organizational learning, is the assumption that the assignment for knowledge creation is unproblematically given from above. In other words, what is to be created and learned is depicted as a management decision that is outside the bounds of the local process (see Engeström, 1999b). This assumption leads to a model in which the first step consists of smooth, conflict-free socializing, the creation of “sympathized knowledge” as Nonaka and Takeuchi call it. In contrast, a crucial triggering action in the expansive learning process discussed in this chapter, as in other analogous processes we have analyzed, is the conflictual questioning of the existing standard practice. In the Boundary Crossing Laboratory, this questioning was invoked by the troublesome patient cases, to be defensively rejected time and again. The practitioners did also begin to produce questioning actions in their own voices; a small example of this was shown in excerpt 2. The analysis of contradictions culminated much later as the conflict between critical pathways (available tool) and patients with multiple illnesses (new object) was articulated in excerpt 5. Actions of questioning and analysis are aimed at finding and defining problems and contradictions behind them. If the management tries to give a fixed learning assignment from above in this type of process, it is typically rejected (Engeström, 1999b). Out of these debates, a new direction begins to emerge, as seen in excerpt 6. The third strategic action in expansive learning is modeling. Modeling is already involved in the formulation of the framework and the results of the analysis of contradictions, and it reaches its fruition in the modeling of the new solution, the new instrumentality, the new pattern of activity. In the Boundary Crossing Laboratory, the first proposal of the project group in session 4 was the first attempt at such modeling (see excerpt 7). The critical discussion and rejection of this proposal (excerpt 8) is an example of the action of examining the new model. The second, successful proposal, presented in session 5, is again an example of modeling, and the ensuing elaboration in session 6 (excerpt 9) again represents examining the new model. The care agreement model has been implemented in practice since May 1998. The manifold implementation opens up a whole different story of tensions and disturbances between the old and the new practice, a story too large and complex to be entered in this paper. The cycle of expansion (Figure 4.6) is | page_70 | not completed yet. Our research group continues to follow and document the implementation and to feed back intermediate findings to the practitioners. We habitually tend to depict learning and development as vertical processes, aimed at elevating humans upward, to higher levels of competence. Rather than simply denounce this view as an outdated relic of enlightenment, I suggest that we construct a complementary perspective, namely that of horizontal or sideways learning and development. The case discussed in this paper provides rich indications of such a complementary dimension. 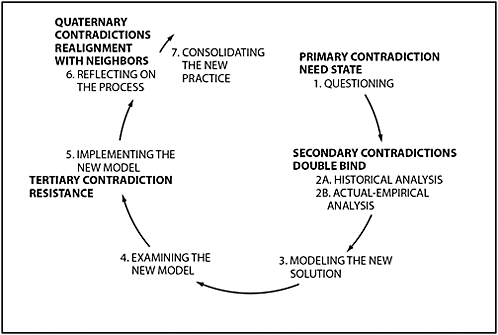 Figure 4.6 Strategic learning actions and corresponding contradictions in the cycle of expansive learning. | page_71 | 1995) and also by the greatest Russian analyst of learning, V. V. Davydov (1990), enriched and expanded Vygotsky’s ideas, but the issue of directionality remained intact.How does this image correspond to the data on expansive learning in the Boundary Crossing Laboratory? Concept formation in the laboratory sessions started out with the “scientific concept” proposed by the management: critical pathways. Instead of identifiable everyday concepts, it was met and confronted by our videotaped cases and live parents, telling about children with multiple illnesses and fragmented care. The meeting was uneasy, if not outright conflictual.What followed was a sideways move. Instead of trying to merge the possibly incompatible worlds of the “scientific concept” of critical pathways and the everyday experience of the patients, a group of practitioners presented a series of alternative conceptualizations. This sideways move started with the poorly articulated idea of automatic feedback on every patient visit from the hospital to the primary care health center. This attempt at formulating a new deliberate concept was rejected “from below,” using the experiential threat of excessive paperwork as the main conceptual argument.The proponents of the new idea did not give up. They initiated another sideways move and proposed a new concept: care responsibility negotiation. This was met more favorably. The practitioners used their experiences of the need for parent involvement (see excerpt 9) to elaborate, refine, and concretize the concept. This led to yet another sideways move: the formulation of the concept of care agreement. Since the spring of 1998, through their actions of implementing this concept in practice, practitioners and parents have accumulated experiences to challenge and transform this concept again in new sideways moves. This account leads us to a new, two-dimensional view of concept formation (Figure 4.7). Bakhtin, M. M. (1981). The dialogic imagination: Four essays. M. Holquist (Ed.). Austin: University of Texas Press. Bateson, G. (1972). Steps to an ecology of mind: Collected essays in anthropology, psychiatry, evolution, and epistemology. New York: Ballantine Books. Chaiklin, S., Hedegaard, M. and Jensen, U. J. (Eds.) (1999). Activity theory and social practice: Cultural-historical approaches. Aarhus, Denmark: Aarhus University Press. Cole, M. (1988). Cross-cultural research in the sociohistorical tradition. Human Development, 31, 137–51. Davydov, V. V. (1990). Types of generalization in instruction: Logical and psychological problems in the structuring of school curricula. Reston, VA: National Council of Teachers of Mathematics. Engelsted, N., Hedegaard, M., Karpatschof, B. and Mortensen, A. (Eds.) (1993). The societal subject. Aarhus, Denmark: Aarhus University Press. Engeström, R. (1995). Voice as communicative action. Mind, Culture, and Activity, 2, 192–214. Engeström, Y. (1993). Developmental studies on work as a testbench of activity theory. In S. Chaiklin and J. Lave (Eds. ), Understanding practice: Perspectives on activity and context. Cambridge, UK: Cambridge University Press. Engeström, Y. (1995). Objects, contradictions and collaboration in medical cognition: An activity-theoretical perspective. Artificial Intelligence in Medicine, 7, 395–412. Engeström, Y. (1996). Developmental work research as educational research. Nordisk Pedagogik: Journal of Nordic Educational Research, 16, 131–143. Engeström, Y. (1999a). Activity theory and individual and social transformation. In Y. Engeström, R. Miettinen and R.-L. Punamäki (Eds. ), Perspectives on activity theory. Cambridge, UK: Cambridge University Press. Engeström, Y. (1999b). Innovative learning in work teams: Analyzing cycles of knowledge creation in practice. In Y. Engeström, R. Miettinen and R.-L. Punamäki (Eds. ), Perspectives on activity theory. Cambridge, UK: Cambridge University Press. Engeström, Y., Miettinen, R. and Punamäki, R.-L. (Eds.) (1999). Perspectives on activity theory. Cambridge, UK: Cambridge University Press. Hutchins, E. (1995). Cognition in the wild. Cambridge, MA: MIT Press.Il’enkov, E. V. (1977). Dialectical logic: Essays in its history and theory. Moscow: Progress. Lave, J. and Wenger, E. (1991). Situated learning: Legitimate peripheral participation. Cambridge, UK: Cambridge University Press. Leont’ev, A. N. (1978). Activity, consciousness, and personality. Englewood Cliffs, NJ: Prentice-Hall. Leont’ev, A. N. (1981). Problems of the development of the mind. Moscow: Progress. Nelson, K. (1985). Making sense: The acquisition of shared meanings. New York: Academic Press. Nonaka, I. and Takeuchi, H. (1995). The knowledge-creating company: How Japanese companies create the dynamics of innovation. New York: Oxford University Press. Vygotsky, L. S. (1987). Thinking and speech. New York: Plenum.